Born in Half Moon Bay and a 4th generation Coastsider, her family immigrated to Half Moon Bay in the 1850's. 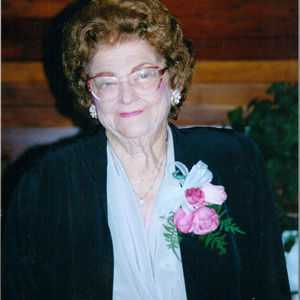 Evelyn passed away at the age of 98 due to natural causes on December 4, 2014 at Three Bell's Convalescent Home in Montara where she resided and was lovingly cared for over the last 3 years and tended to by Pathways Hospice in her final days. Evelyn is survived by her only son, Ronald Cardoza and daughter-in-law Regina, grandchildren Suzanne Peterson (David) of Half Moon Bay and Ronnie Cardoza of San Gregorio, 2 great-grandchildren Danielle and Ethan Peterson and her sister Margaret "Bud" Machado also of Half Moon Bay. Evelyn is preceded in death by her parents William and Elvezia Marsh, her brother Henry "Buck" Marsh and sister Dorothy "Barney" Cardoza. Evelyn spent her career working for the Northern California Retail Clerks for over 23 years starting with See's Candy and retiring at Hillsdale Bakery in 1981. She spent the many years of her retirement enjoying her love of baseball by attending her grandson Ronnie's Little League games and never missing her beloved SF Giants for spring trainings in Arizona or televised viewings of the games. She made frequent visits to her "lucky" slot machines at Harvey's Casino in Lake Tahoe where she always seemed to come home a winner. Evelyn also had the opportunity to go on a couple of cruises where she sailed the Caribbean and to Alaska. Evelyn was an active member of Our Lady of the Pillar Catholic Church, Brotherhood of St. Anthony, PFSA Society and the IDES. A rosary will be held on Tues., Dec. 9 at 7pm and a Funeral Mass on Wed., Dec. 10 at 10a, both at Our Lady of the Pillar Church in Half Moon Bay. She will be laid to rest at Skylawn Memorial Park immediately following the mass. A reception will follow at the IDES Hall in Half Moon Bay. In lieu of flowers, memorial tributes may be made in her memory to the Alzheimer's Association Northern California, 2290 North First Street, Suite 101, San Jose, CA 95131. The beautiful and interactive Eternal Tribute tells Evelyn's life story the way it deserves to be told in words, pictures and video.